It’s been a good six weeks since my last post on here. Before that it was almost the same amount of time. Truth be told, I’ve been too damn busy to write! Busy is good. Unless you take on too many commitments as I tend to do. 🙂 I really like writing so I’d like to continue this blog. The problem is by the time I’m done with my “work” I’m too mentally exhausted. So if I want to keep this up, I need to find a way for this to become my work. So I’ll start with explaining exactly what I do. I have many different jobs (or “buckets”, hence my bucket list). In this day and age that’s not unusual, especially in the creative fields. Tyler Weaver has a great website at www.Multi-Hyphenate.com that goes more into this sort of lifestyle. 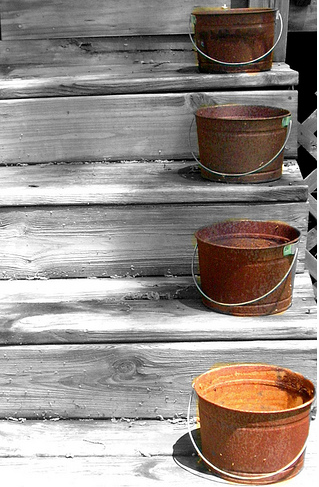 But first, here are my buckets. This has been my bread and butter for the last couple of years. I do enjoy photography, but would also like to be involved in other projects. So I’ve grown the business to include three employees (besides myself) including one new photographer that I’m training. Ultimately I’d like to step back a bit from the actual photography and run the business and marketing. Registration just opened for the 2010 Cleveland 48 Hour Film Project. It’s a great competition where filmmakers have 48 hours to write, produce, and edit a short film. This will be my third year as the Cleveland Producer, and I really enjoy putting this together and working with the local filmmakers. This year I’ve also been asked to take on a little more responsibility, so over the summer I’ll also be the Assistant Director of Operations (with one other person holding the title as well). I’ll continue to run Cleveland and also help out with close to 30 other city competitions around the world. Also as of January I have been the editor of their monthly newsletter, which goes out to 50,000 filmmakers around the world. At this time most of the writing I do is for that. Notice there’s no URL to visit, because the company doesn’t really exist yet. This is sort of my dream job, a multimedia production firm that ties together video, photography, graphic and web design to create quirky and creative pieces. I’d like it to be less of the traditional advertising route, but more along the lines of “advertainment”–short films used as advertisements where the product becomes a part of the film. BMW produced a great series a few years ago where Clive Owen starred as the Driver–very cool short films. I’m using some of the money from photography to help fund this business, but the problem is still money to purchase equipment. Luckily I’m fortunate enough to work with a lot of great creative filmmakers that I’m trying to partner up with. I’m currently working on a short promo video for a Cleveland nightclub, which should hopefully start production in the next two weeks. This is a taped version of an acting workshop I did in January. I really wanted to have this done already, but with a two camera shoot I have roughly eight hours of me talking on video to edit. This is something I really need to get off my plate so I’m hoping to get a rough cut done in the next week. Ultimately this will ship as a direct download or DVD with a separate resource guide. In addition to all of the above I attend school full time–I’m studying for my B.S. in Entertainment Business from Full Sail University (online). Tack on a fiancee and three kids and I’ve got some very full buckets. No wonder I’m on creative burnout! I hope to be able to use this blog to highlight all of these projects on more of a day to day basis. So you can expect some less-polished articles, but more updates more frequently. Hey Brian – pleasure meeting you the other day. Great post – and thanks for the Multi-Hyphenate plug!